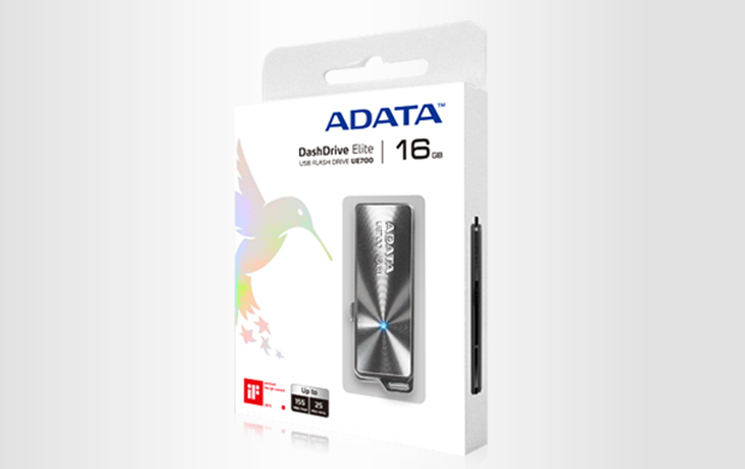 Taipei, Taiwan – March 12, 2013 - ADATA™ Technology, a leading manufacturer of high-performance DRAM modules and NAND Flash storage application products, today announces the launch of the DashDrive Elite UE700 USB 3.0 flash drive. 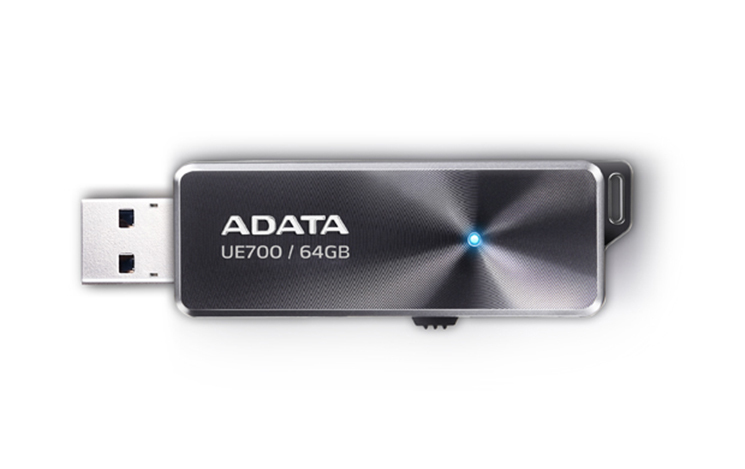 As ADATA's fastest USB flash drive yet, the UE700 is a striking blend of technological development and design aesthetics. With 200MB/sec read and 100 MB/sec write speeds, the UE700 outperforms the vast majority of USB flash drives available on the market today. The improved transfer speed of the UE700 arrives at an opportune time, with USB flash drives being called on to store and deliver personal media content of higher quality and file size than ever before. Design-wise, the slim UE700 delivers the style and symmetry that consumers have come to expect from ADATA. The brushed aluminum surface highlights the sleek concentric lines that emanate from the blue LED indicator. The retractable USB connector design not only brings convenience of use, but also keeps the connector protected inside the drive body when not in use. An integral loop allows for easy attachment to a lanyard or keychain. Available in 16GB, 32GB and 64GB capacities, the UE700 is looking to be the smart choice for professionals and those who place a high value on sleek aesthetics and data speed. Purchasers of the UE700 can also take full advantage of ADATA’s free and proprietary value-add software, including UFDtoGO, OStoGO and the latest Norton Internet Security™ 2013 (60-day trial). The DashDrive Elite UE700 is backed by a lifetime product warranty. The DashDrive Elite UE700 will be available through selected distributors and resellers in the Europe.